San Francisco native and amateur historian Jacob Berman is back, as promised, with another painstakingly reconstructed map of a Bay Area transit system that was lost to history. This time, the New York-based attorney mapped out San Francisco's cable car system prior to the 1906 earthquake. At first glance, the map might appear to represent the modern-day Muni lines, so tangled and widespread is its network. 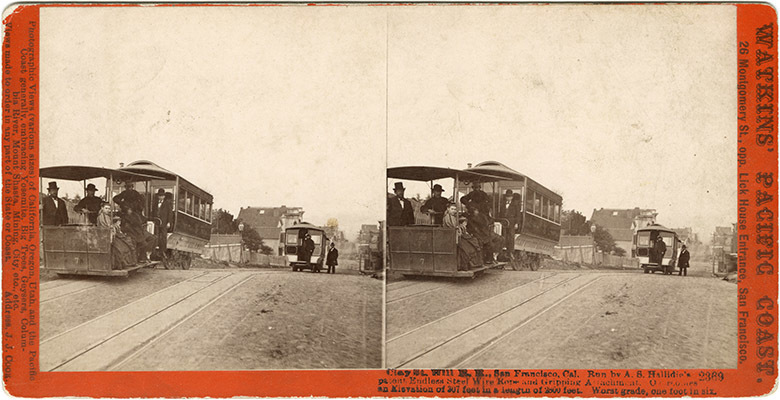 But it actually depicts the transit options available to a San Franciscan in December, 1892. "This one took a month or so to put together," said Berman. "Part of it is just defining the problem of, what do I want to show?" 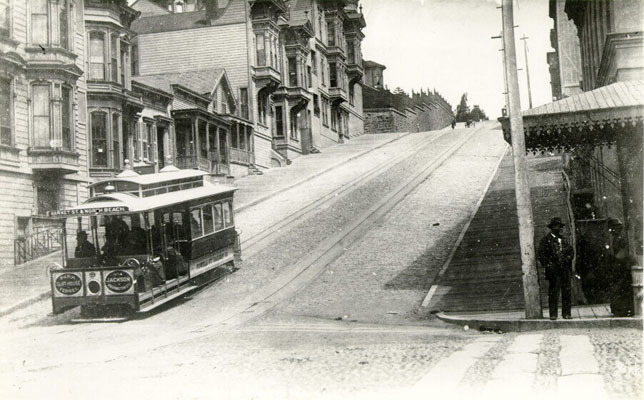 He could have gone with 1873, when Andrew Hallidie welcomed riders onto the first cable car atop Nob Hill, but that would have made for a sparsely detailed map. He could have depicted the transit experimentation of the 1910s and '20s, when a "tremendous diversity" of options, from cable cars to steam engines to electric street trolleys, competed for riders, but that would have been cluttered, and divergent from the cable car focus. 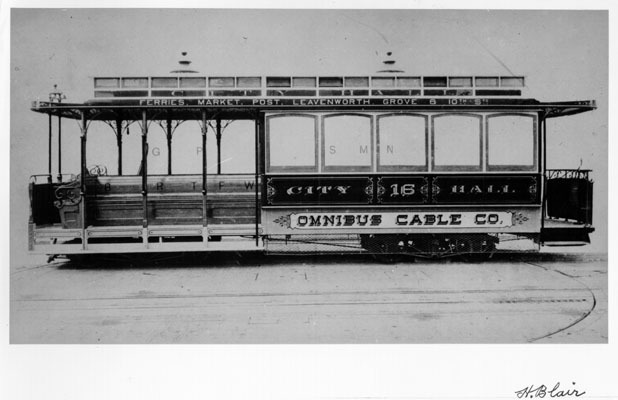 "The reason that I specifically nailed down the 1890s," he said, "is that in 1893, one of the major cable car companies was merged into the Market Street Railway." 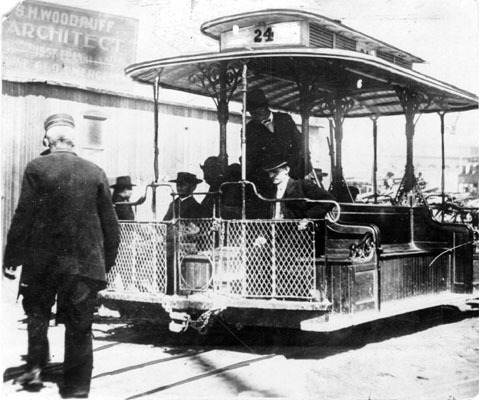 December 30, 1892, therefore, saw the now-vestigial transit system at its greatest and most diverse extent, when 12 lines run by seven companies streamed across the city. 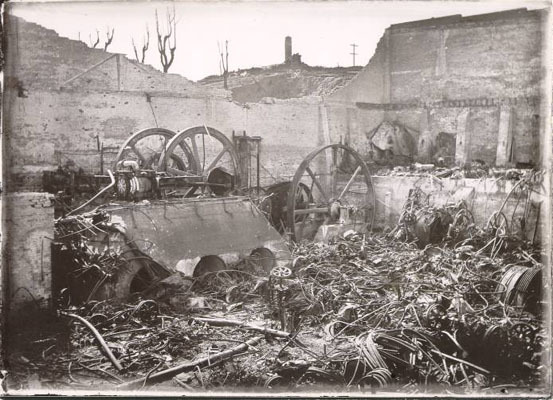 Berman embarked on his research by visiting the Cable Car Museum's website, which tracks the system's evolution through articles, maps, photos and mechanical explainers. These resources laid the groundwork for the colored routes on Berman's map. His next stop was the David Rumsey Historical Map Collection, a free trove of rare maps dating from 1550 to 2018. Tools on the site that allow side-by-side comparison of its 88,000 online maps were especially helpful to Berman, who was looking for actual, as opposed to speculative, representations. "Cartographers 100-and-some-change years ago would show paper' streets as much as actual streets," he explained. In these aspirational maps, writes Streets Blog SF's Chris Carlsson, "one can enjoy the strange city that extends well into the bay off the southeastern shoreline." Then, it was on to the actual mapmaking. Berman assumed the role of a practical-minded 19th century cartographer. Hitting his target -- a map that would have been legitimately useful to 19th century riders, but also appealing to his contemporary audience -- required balance. Color, prohibitively expensive for many cartographers in 1892, was a must-have for Berman if he wanted to emphasize the competitive landscape. For his font, he wanted to avoid the kitschy "Old-West-period style," so he selected a script font based on 19th century handwriting ("Map of the") and a serif font that was a common second or third choice among printers in 1892 ("San Francisco Cable Car System"). But is what would have been useful in 1892 useful in 2018? Berman, who eventually hopes to move back to the Bay Area, sees the map as a possible vision for the city's future. "If you have, in an accessible format, a way to see what was lost or what used to be, it's easier to envision what might be," he said. 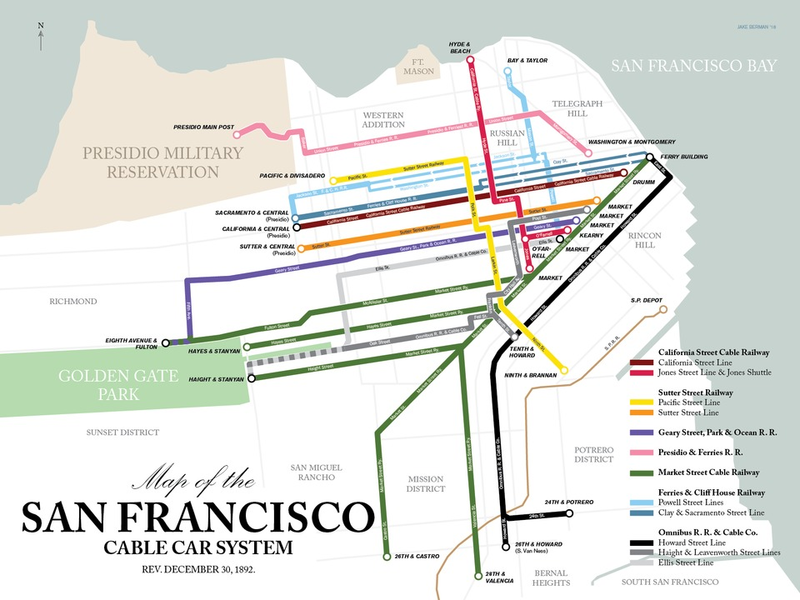 "Imagine the cable line down Geary or Howard. Then why not envision a subway line down Geary today? It's a question of vision at its most basic." Berman's cable car map sells for $30 on his website, where you can also find his map of Oakland's Key System and other urban transit maps.